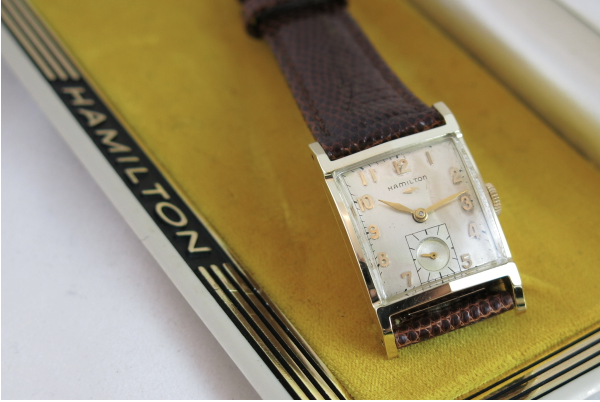 Hamilton's line up of asymmetric watches is full of very popular models. 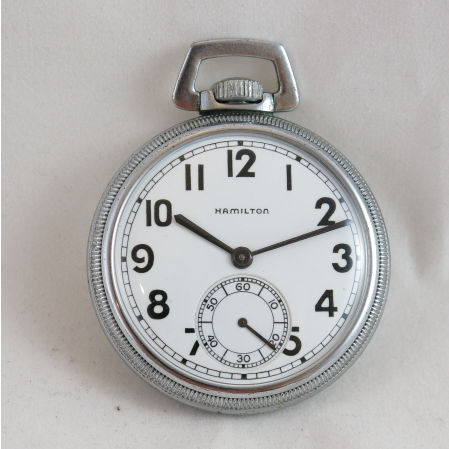 Some of Hamilton's asymmetric models sell today for well north of $4,000! Many of them are Electrics but a good portion of them are manual-winders or automatic models too. 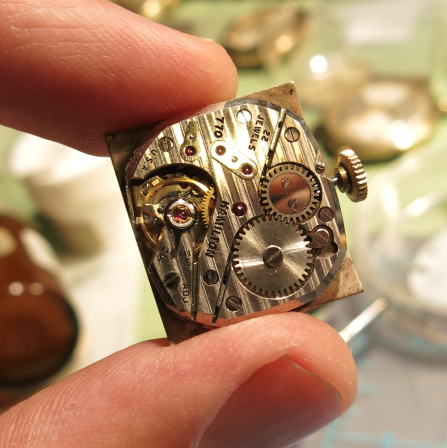 Electric watches are very special, to be sure, but they're a little too complicated for me to work on and require specialized skills that most watchmakers are not familiar with. So, you aren't going to see many Electric models on my blog - if any. I don't even like changing the batteries in them, to be totally honest. 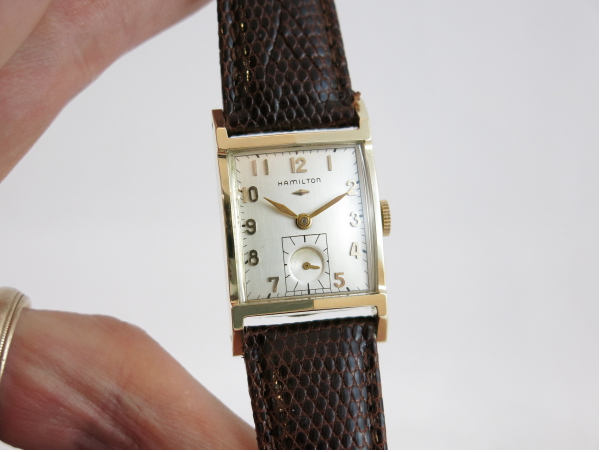 As another example, I recently purchased a Lord Lancaster C - it's a mechanical asymmetric watch. 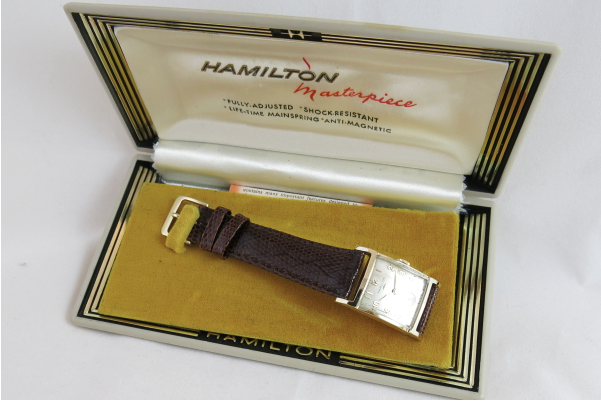 It was introduced in 1963 and produced through 1969, when Hamilton ceased manufacturing in the USA. 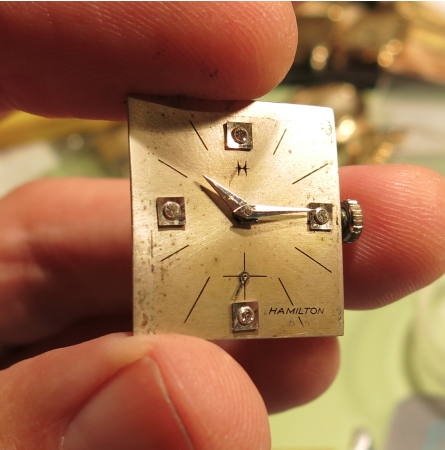 The Lord Lancaster C is a white gold filled model with diamonds on the dial. 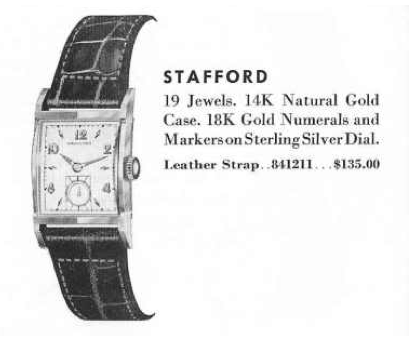 There are a number of Lord Lancaster models and each is white in color with diamonds on the dial. 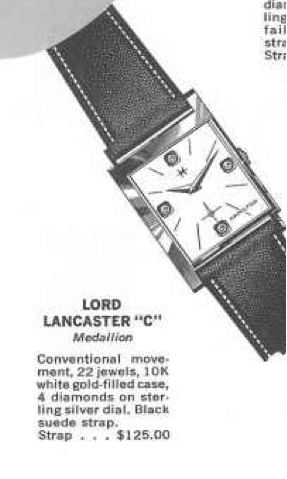 The Lord Lancaster C looks very similar to another asymmetric model called the Blade, which was introduced in 1962. 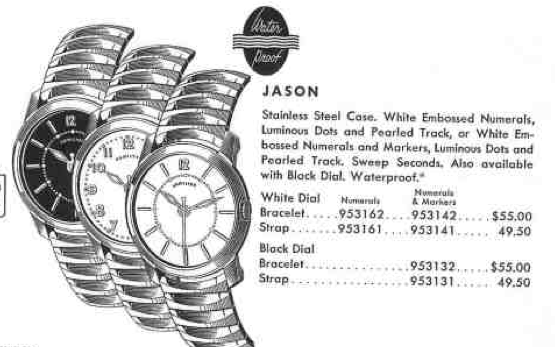 As you can see, the Blade looks very similar (especially in black and white) although it only came in a yellow gold filled case. 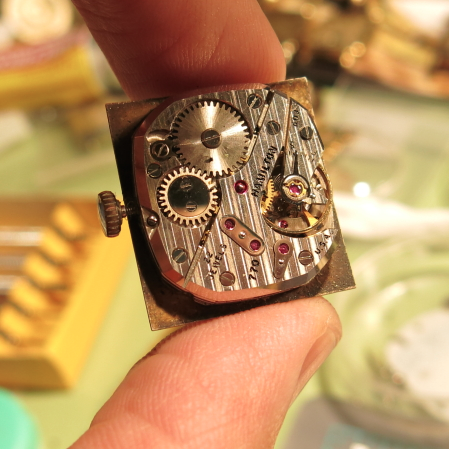 Behind the diamond dial of the Lord Lancaster C is a 12/0 sized, 22 jewel 770 movement. The Lord Lancaster C that I purchased came with a rather funny story. 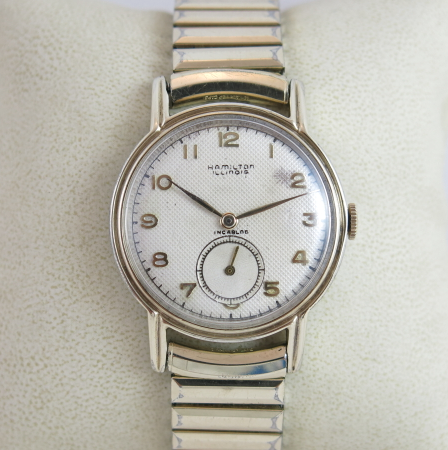 I saw it posted on a "buy it now" price that was a real bargain - as this watch routinely sells for north of $500. I also knew the seller and I thought he may have made a mistake in selling it... so I bought it so no one else would get it first. 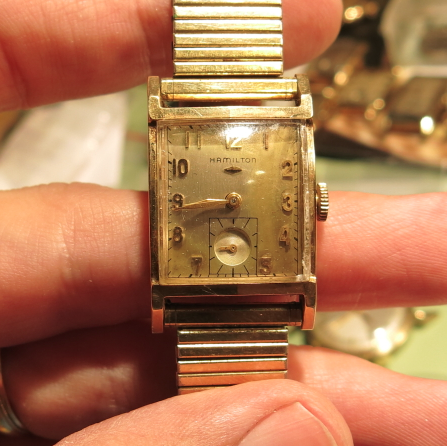 As it turns out, he recognized me by my eBay ID too - and I could tell he had some seller's remorse in selling it. 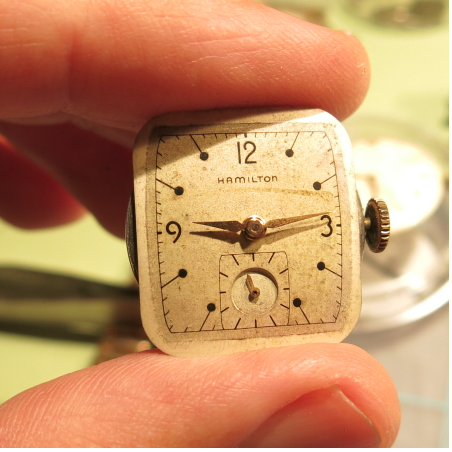 So I offered to overhaul it for him, fix it up, post it on my blog and send it back to him. So, it ended up being a win-win for both of us! 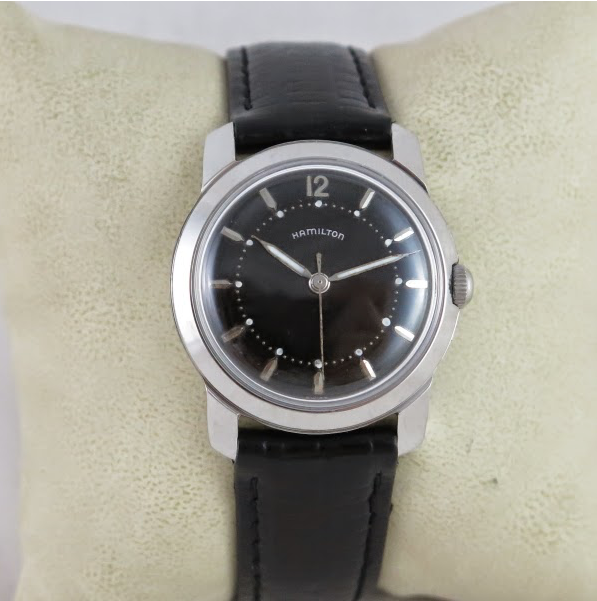 I get to say I've owned a Lord Lancaster C (and show it to you) and he gets a much improved watch that he can keep or sell (hopefully for top dollar). 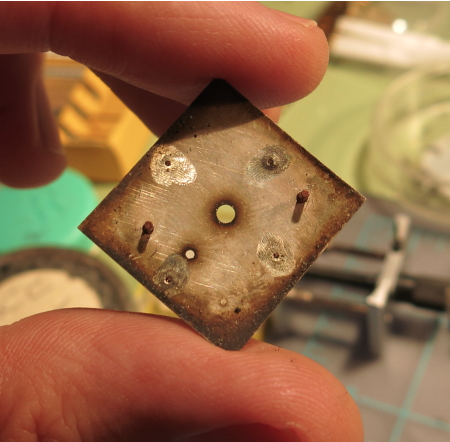 Anyway, here's what I started with... it was mighty dirty and needed some serious cleaning. 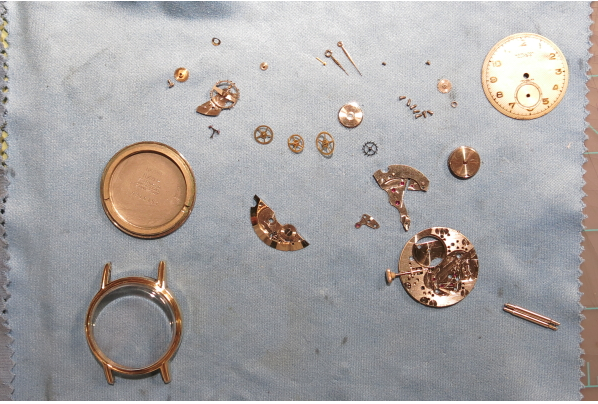 The inside of the watch was equally dirty and although the 770 ran, it was definitely in need of some TLC. 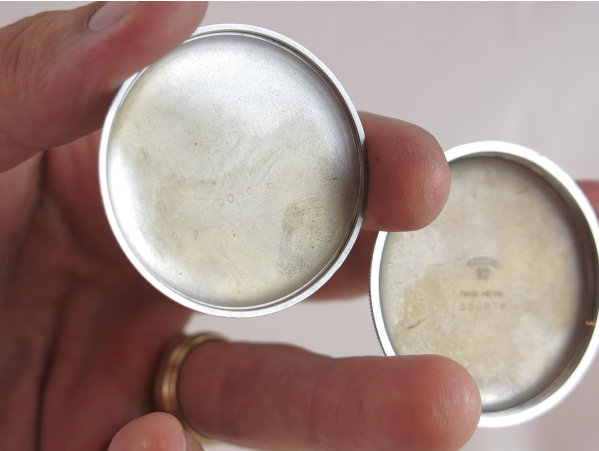 The white gold filled crown was also very worn... it's amazing what a difference a new crown can make in the appearance as well as in winding a watch. 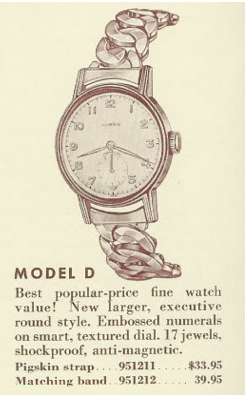 The dial was pretty dirty. 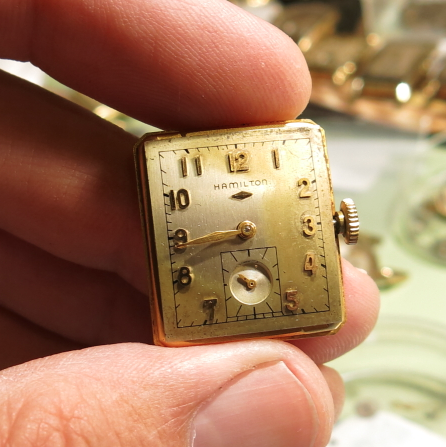 It's hard to tell if some of the diamond hour markers are crooked or not. They're riveted on and could potentially be rotated but that's risky business to attempt. 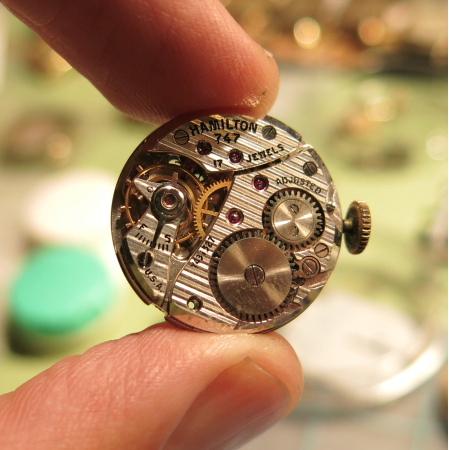 This style of hands is call "dauphine". 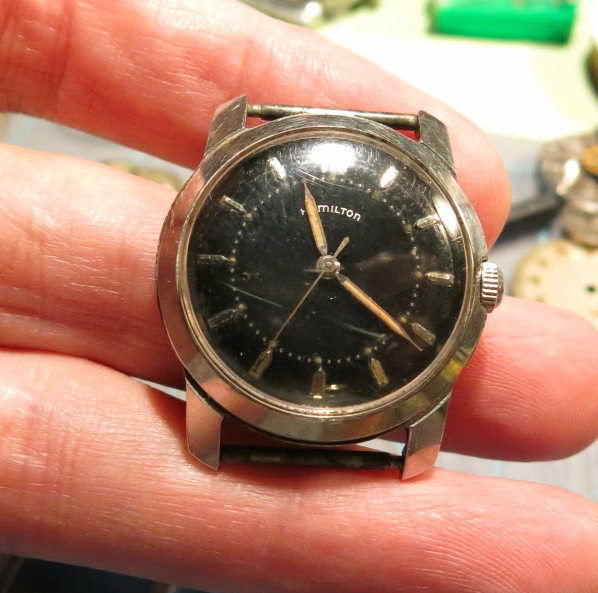 With the dial removed, a close inspection of the back side shows some grime from the past 50 years of use but no other indicators of past refinishing. 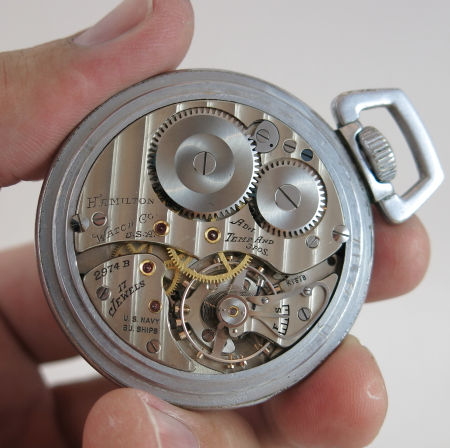 That's good, as original dials usually clean up much better than refinished dials. I'll spare you the blow by blow details of disassembling and reassembling a 770. If you're curious you can see me do it here. 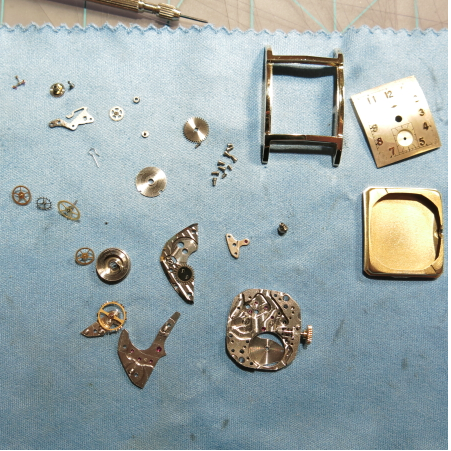 However, this 770 went back together very smoothly and was easily regulated to keep very good time. 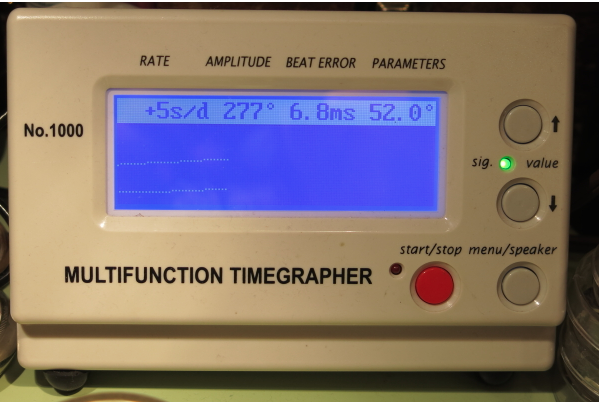 The shot below of my timer shows the watch runs slightly fast with good amplitude (well north of 200 degrees). The beat error is a little high but I don't like messing with that on this style of balance so I'll leave it as-is. And here it is all cleaned up. 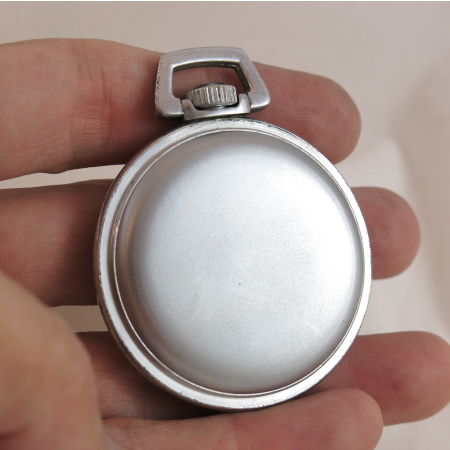 The expansion bracelet is not original to the watch. 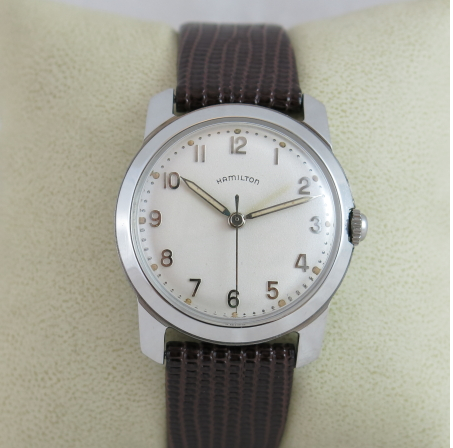 This watch really should have a black suede strap. 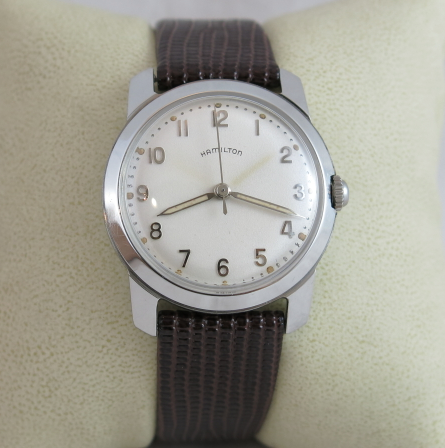 However, I did have a nice lizard strap to match it to at least for the photos. 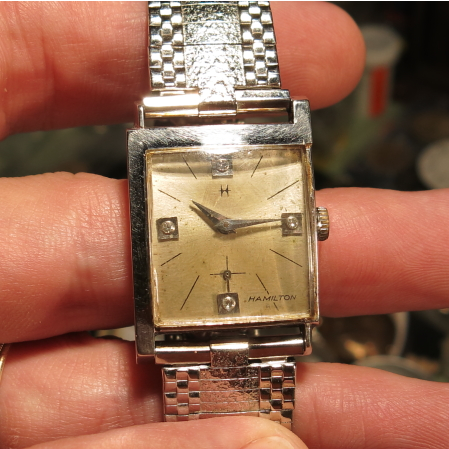 The crystal still needs to be replaced - I have one on order - and once it's installed this watch will be ready to go back home. 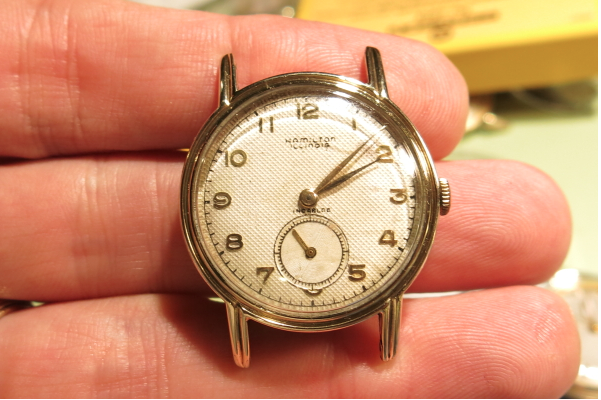 I think the dial cleaned up okay but it's certainly not "new" looking. 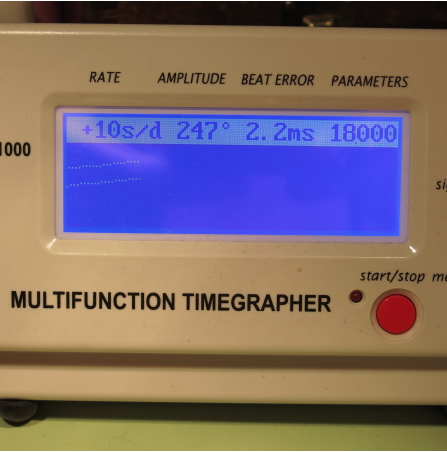 You have to know when to stop with cleaning dials because there's a very fine threshold between "clean" and "ruined" by losing all the printing. 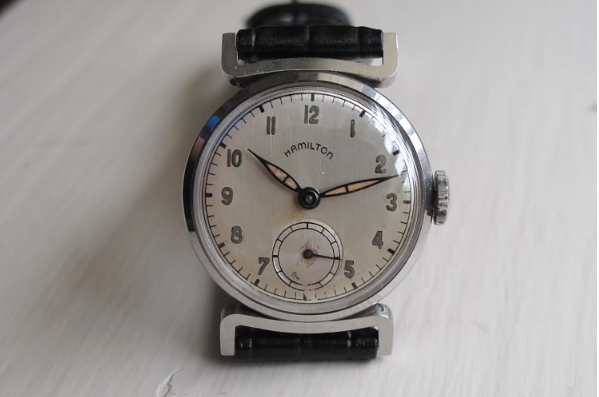 This shot below of the watch from the right side shows the newly installed Hamilton crown with the H logo - a vast improvement over the other crown. 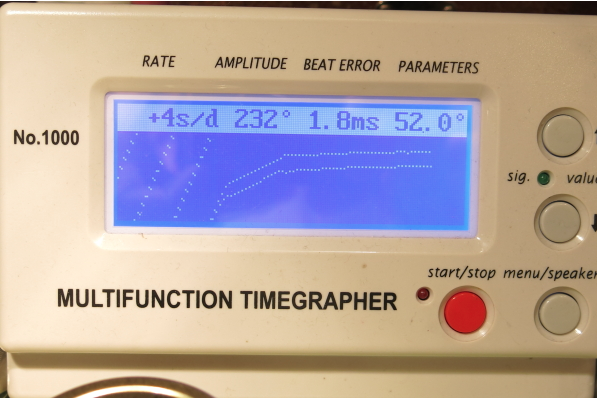 It looks and functions great. 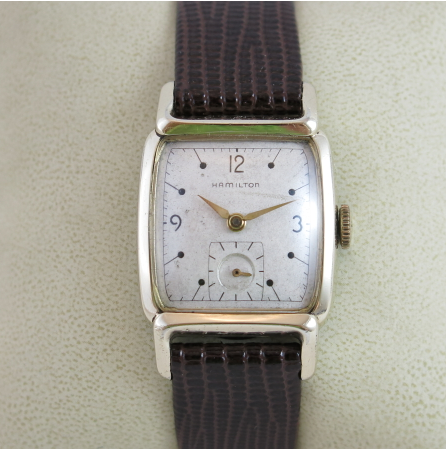 Part of the challenge of maintaining a blog is having new posts of watches I haven't already shown before. After 180 posts, it's really hard not to have repeats. However, I've got a few new things in the hopper to show you during July - so stay tuned. 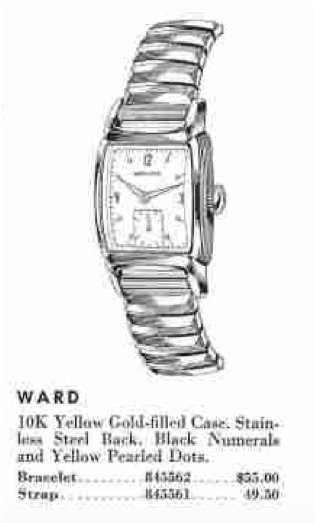 For starters, here's a 1955 Ward. 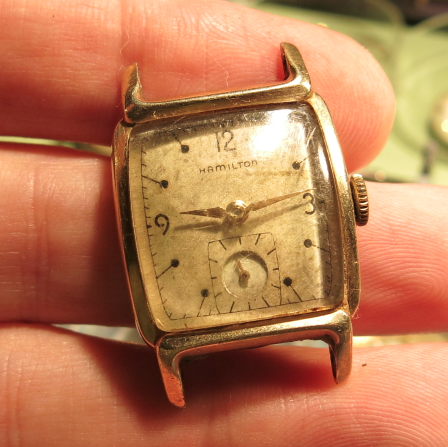 The Ward was produced for three years and I think there are two dial varieties out there... one with gold dots and one without. 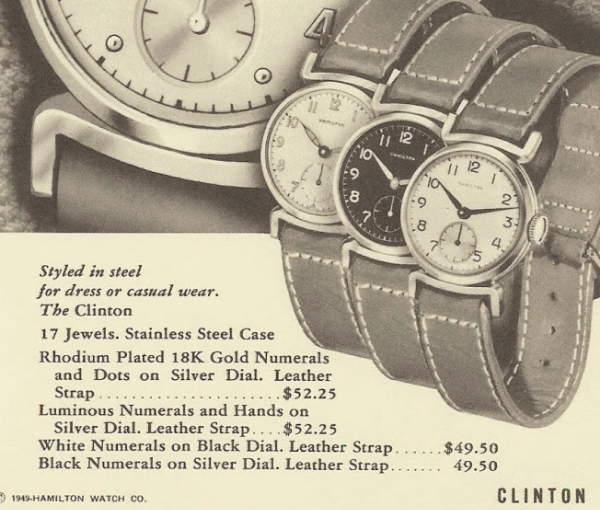 As you can see in the 1955 catalog, the dial is described as having "black numerals and yellow pearled dots"
And then in 1956 the catalog describes the dial as having "black numerals and pearled dots". 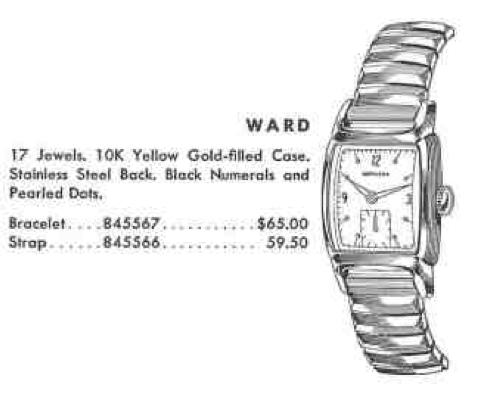 The Ward has a 10K yellow gold filled case with a stainless steel back. 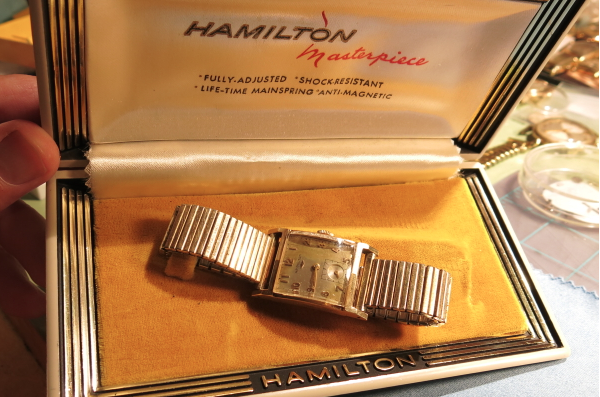 Inside is an 8/0 sized American-made 17-jewel 747 movement, or possibly the 730, as Hamilton replaced the 747 with the upgraded 730 around the time the Ward was in production. The hands on a Ward are yellow alpha style. I recently picked up a Ward in need of some TLC. I got a pretty good deal on it since it was in pretty rough shape. 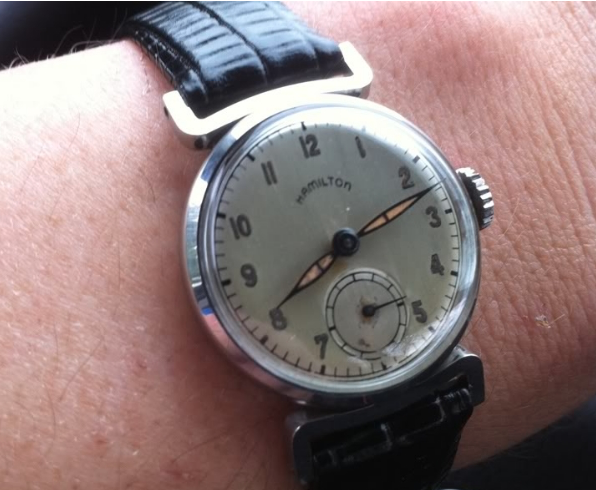 Now I'm going to go out on a limb and call this a 1956 or 57 model since the dial has black pearled dots. 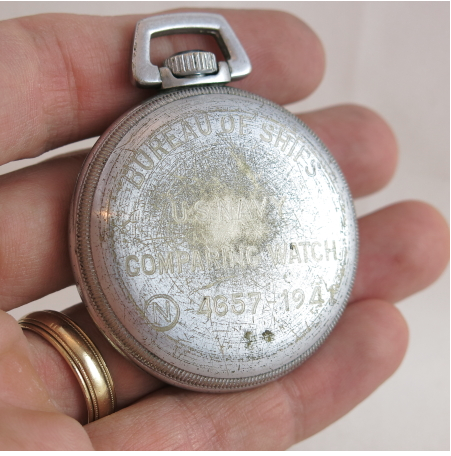 The dial appears to be original and there are no markings on the back of it to indicate otherwise. The 747 inside had a broken balance staff - easily diagnosed since the balance (on left) wobbles. 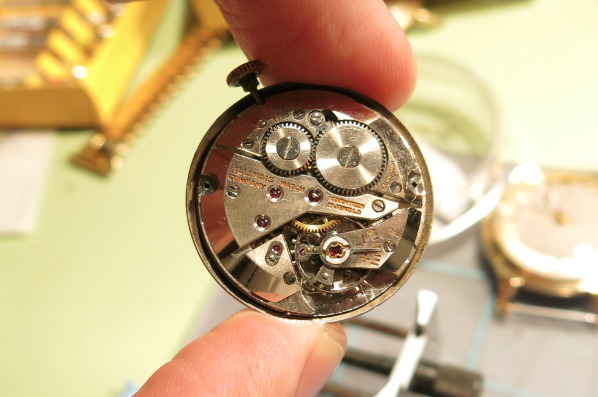 The hairspring on the balance is also a mess - so this balance will need to be replaced in it's entirety. 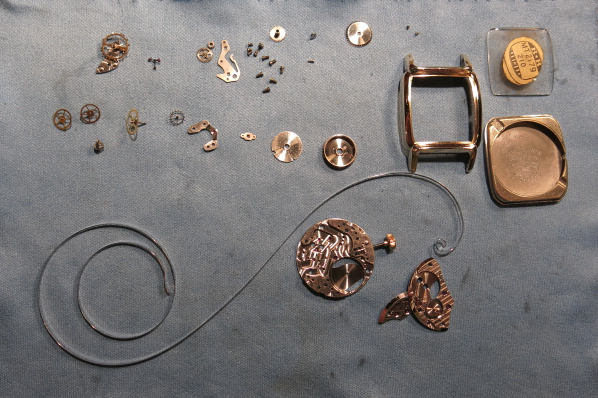 Everything get's disassembled, cleaned and set out to dry. 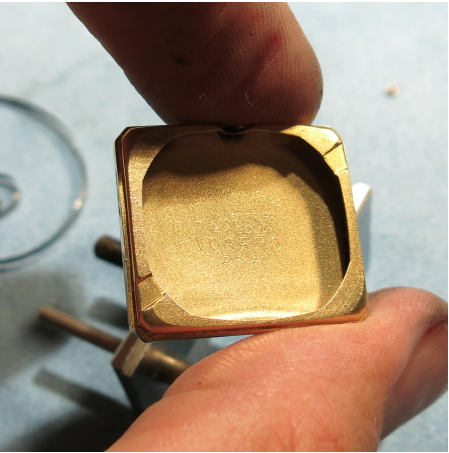 I've also got a new old stock glass crystal to install in the bezel. 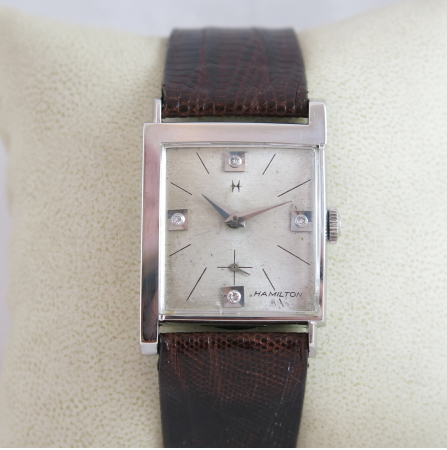 With a new balance and a fresh mainspring, this 747 is back in action and ready for another 60 years of use. 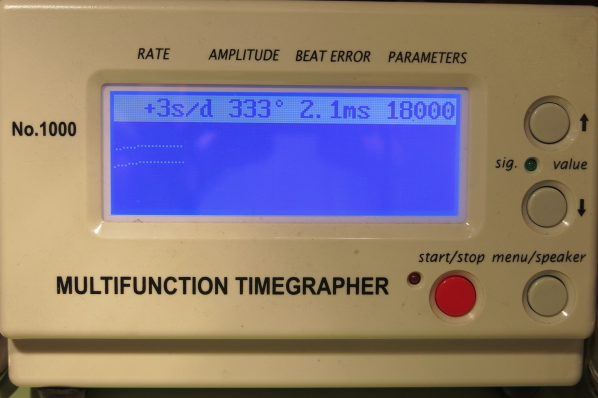 It's running 3 seconds fast per day with great amplitude. 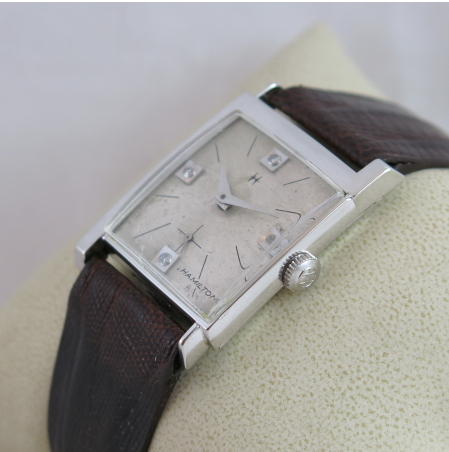 And here's the finished product, all polished up with a clean dial and new lizard-grain leather strap. 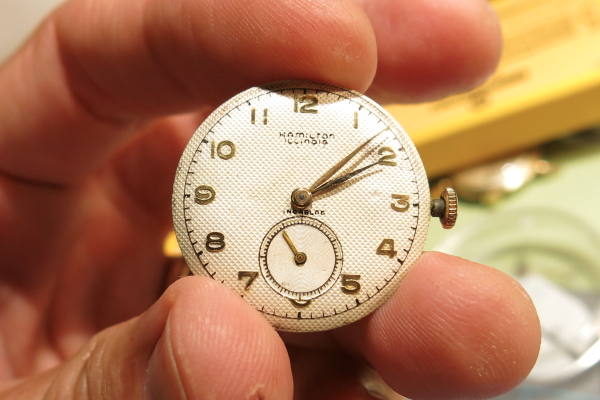 Not a bad restoration, if I do say so myself.